Place the sole fillets in a baking dish and sprinkle with salt and black pepper. Pour over the boiling wine and fish stock. Cover and bake in a moderate oven (180ºC / 350ºF or Gas Mark 4) for about 8 to 12 minutes or until the fish is cooked. Put the spinach in a saucepan – don’t add any water, cook until the spinach is tender (I know, but do it and see). Meanwhile, melt the butter in a saucepan, stir in the flour and cook, stirring, for 1 minute. Gradually stir in the milk, then the fish stock and bring to the boil, stirring and stirring, then simmer, still stirring, until the sauce is thick and smooth. Now remove from the heat, add the Parmesan, Gruyere, cream and seasoning. Stir it well and keep it hot. Drain the cooked spinach, pressing hard to remove ALL excess moisture, then chop it up, add the butter and salt and pepper to taste. Mix it up and spread it over the bottom of a flame-proof serving dish. Top it with the sole fillets and pour over the sauce. Pop it under the grill until the top is lightly browned. Now you deserve a nice glass of white wine to go with it if no one has already poured you a glass. Mean, looks tasty indeed. 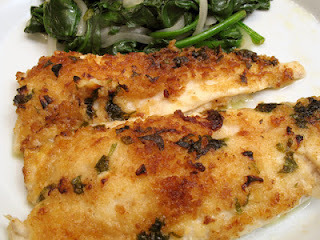 Spinach is great, but that sole looks delicious! Jon - it is well worth a try if you have not yet done so! Let us know how you get on.